Note: Since the time I wrote this article (in February 2011,) avast!’s memory usage increased to around 100 MB. I uninstalled it. Although maybe not the most secure choice, I went with Microsoft Security Essentials which seems a bit better. Progress. Gotta love it. Shame on you, avast! I have a small laptop that I use a lot when I’m not at home. It is not very powerful with an Intel Centrino and only 512 MB of memory, but it works perfectly fine under Windows XP and has a fantastic battery life of more than 8 hours. That is… up until this year. Suddenly booting took half an hour, and every, literally every application was as slow as a snail in a bath of wallpaper glue. Task Manager. See 'PF Usage' for an indication of memory used. The reason for this was easily found. Windows Task Manager revealed my laptop used more than 512 MB memory, right after booting, before any application was started. What changed? My virus scanner, AVG. AVG was just upgraded to the shiny new version 2011, and since then my computer was slow. Guess what? AVG 2011 used more than 200 MB memory. My computer’s speed was back to normal after uninstalling it. I didn’t want to use my computer without a virus scanner completely, though, so I did a small investigation. From the well-known free virus scanners, avast! turned out to be the least memory hungry: about 20 MB memory, or less than one tenth of what AVG needs. Here’s a table of the memory usage of the virus scanners I tested. The memory usage measured varies somewhat, but that doesn’t seems to make a huge difference. avast! leads the pack by a long distance. AVG is… horrible. The first three are ‘the big three A’s’ in the free antivirus world. The applications are decent, the virus detection is fine, and there are regular updates for the virus definitions and the engine. All of them are adequate for a computer that is used with a little bit of responsibility. Panda is a a bit different: it is a thin client that connects to ‘the cloud’ to check for viruses. In other words, the actual virus scanning is done on a server somewhere out there on the internet instead of on your local machine. I was convinced that this would give superior memory usage, but as you can see from the table, it doesn’t. It’s not bad, but not special either. The method I used to measure the memory usage of the four virus scanners was not very scientific, but very practical. After installing a scanner on my laptop I rebooted it, made a note of the PF usage in the task manager after it ran for a while, and repeated that a few times. I also did that with no virus scanner installed. 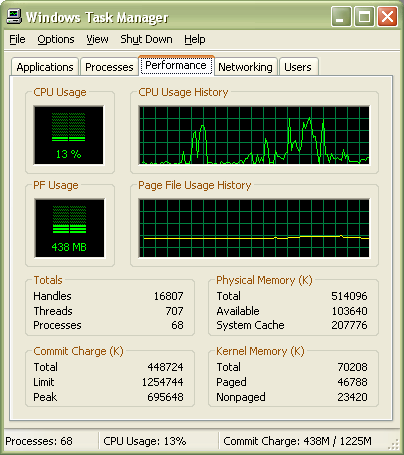 The memory usage is calculated by comparing the memory used without a virus scanner to the memory used with it. This only measures the memory usage of the resident scanner. I hardly ever scan a file or set of files explicitly, and regular scans can take place while I’m away. For the quality of the resident scanners I rely on various sources on the internet. They’re all fine. Lastly, I don’t care about the user interfaces of virus scanners, whether they are easy to use, look modern, have animated icons or transparent windows. Virus scanners are supposed to be invisible. Why is it important to use a small amount of memory? If you’re not a hard-core gamer or a scientist running simulations, the only factor that determines the (perceived) speed of your computer is the amount of memory you have. And it is not a sliding scale; it’s a binary switch. You have enough or you don’t have enough. If you have enough memory, your computer performs well; if you don’t have enough, it starts swapping things to disk and your performance is down the drain. Have a slow computer? Disable Google Desktop, uninstall MySQL, get rid of Internet Information Services… and get the smallest resident virus scanner you can find. This entry was posted in programming and tagged memory, performance, virus scanner, Windows on 12/02/2011 by Dion Nicolaas.